Male on the left and female on the right. 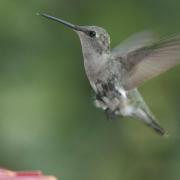 Description:The Ruby-Throated Hummingbird is 7–9 cm (2.8–3.5 in) long and has a 8–11 cm (3.1–4.3 in) wingspan. Weight can range from 2 to 6 g (0.071 to 0.21 oz), with males averaging 3.4 g (0.12 oz) against the slightly larger female which averages 3.8 g (0.13 oz). Adults are metallic green above and greyish white below, with near-black wings. Their bill, at up to 2 cm (0.79 in), is long, straight and very slender. As in all hummingbirds, the toes and feet of this species are quite small, with a middle toe of around 0.6 cm (0.24 in) and a tarsus of approximately 0.4 cm (0.16 in). The Ruby-throated Hummingbird can only shuffle if it wants to move along a branch, though it can scratch its head and neck with its feet. The species is sexually dimorphic. The adult male,has a ruby red throat patch, also known as a gorget which may appear black in some lighting, and a dark forked tail. The female has a dark rounded tail with white tips and generally no throat patch, though she may sometimes have a light or whitish throat patch. The male is smaller than the female, and has a slightly shorter beak. A molt of feathers occurs once a year, and begins during the autumn migration. Primarily an Eastern United States species. 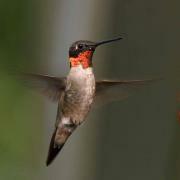 1^ a b c d "Ruby-throated Hummingbird, Life History, All About Birds - Cornell Lab of Ornithology". Allaboutbirds.org. Retrieved 2012-11-07. 2^ "John James Audubon's Description of the Ruby-throated Hummingbird". Rubythroat.org. Retrieved 2012-11-07. 3^ "Hummingbird: external appearance, ageing, sexing". Ruby-Throat.org. Retrieved 13 June 2011.